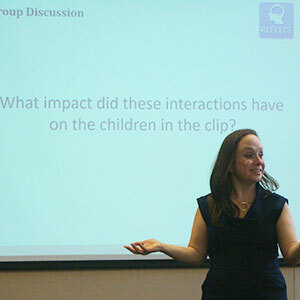 CPHHS Assistant Professor Bridget Hatfield, with support from HDFS graduate students and the Hallie E. Ford Center for Healthy Children and Families, is helping local teachers learn about emotionally supportive interactions and relationships in early childhood classrooms through a new workshop. Picture this: Your preschool or childcare center has just received a new toy truck for the sandbox. But instead of nicely sharing, every child wants the toy to be theirs. As an early education teacher, how would you approach this situation? CPHHS Assistant Professor Bridget Hatfield is helping teachers find answers to that question through a new workshop that teaches emotionally supportive interactions and relationships in early childhood classrooms. Bridget designed the workshops – “Intentional Teaching: Building Emotionally Supportive Early Childhood Classrooms” – based on ones she helped conduct during a postdoctoral Institute for Education Sciences Fellowship at the University of Virginia. The interactions discussed in this workshop are based on how the Classroom Assessment Scoring System™ developed by researchers at the University of Virginia defines responsive interactions. “Interventions, workshops and coursework have been developed around these types of interactions because we know from multiple research studies and experimental trials that they support child academic, social and emotional development,” she says. Her recent article in Child Development illustrates how responsive interactions in preschool promote children’s gains in language, literacy and self-regulation. Bridget says the workshops for early care and education professionals in the Corvallis community aim to bridge that gap between research and practice. The three-hour workshop consists of lecture instruction, videos, group work and discussions on topics covering three types of responsive, emotionally supportive interactions – positive climate, teacher sensitivity and child perspectives. Bridget says this information is necessary for childcare workers, considering many children spend more waking hours at school than at home. Based on the turnout, waiting list and feedback from the two workshops held in March, Bridget says it’s clear local childcare workers see the need as well.